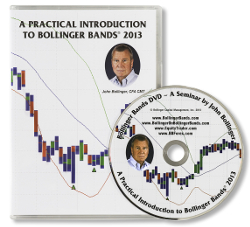 You can customize your charts with Bollinger Bands and over 50 indicators, TrendLines and systems/stops. If you are not sure what an indicator does, just click on the ? for a quick explanation. Control the number of days shown in the chart by clicking on the + - or expand/contract the data by dragging the highlighted area. To add additional indicators to the chart select from the Oscillator list. When the close is higher than the open the body is green. When the close is lower than the open the body is red. 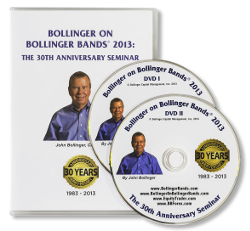 For PRO users only: Arrows plotted on the charts indicate a signal for John Bollinger's four Methods. The arrow is green or red, up/down, to depict the bullish or bearish trend.